*Pre-orders will receive an exclusive NEMESIS print and a NEMESIS bath bomb. 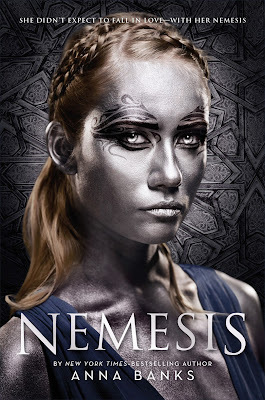 Wow Nemesis by Anna Banks completely sucked me in! I actually didn’t realize the book was a series. I’m not sure why but I’m hoping the next book is in the POV of a couple different characters. Sepora was such an interesting character for me to read because I had my moments where I didn’t like her and moments I did. I actually kind of loved that about her. She is very strong, wise and completely observant. As much as she was mistreated in her own kingdom, she still is strongly concerned about the people who live there. She is willing to bend in order to keep war from happening. Her ability to produce Spectorium as a Forger is both a blessing and a curse for her. The part where I had mixed feeling about her is her reaction to some of Tarik’s action. As someone who is a Princess of another kingdom and deceiving the King of another kingdom. I thought her lack of understanding in some situations baffled me. She is willing to do whatever she needs to save her people but almost looks down on Tarik when he does the same. I loved Tarik the Falcon King. Another cool ability here as a Lingot. He is able to discern truth from fiction. I really like the way he carries himself and cares about his kingdom in the broader spectrum instead of just supporting the superiors. He’s able to keep an open mind when dealing with affairs that allow him to be a better ruler. He often says he is not as physically strong as his father and brother Sethos but that’s not always the most important thing. I liked the romance because it was slow brewing. Both sides are leary of the other due to their political interest. They have many things they have to work out but truly enjoy the company of the other. It’s all so very complicated. I loved Sethos, Tarik’s brother. I’m really hoping his POV and the princess of Hemut are included in the next book. They were both side characters that we only had snippets of in this book but you can tell their stories would definitely be interesting. I enjoyed the World Building and the influence of different cultures into the kingdoms. We spend so much time in Theoria, which is Egyptian inspired but I would love to get a peak of some of the other kingdoms. Completely aesthetic but as cool as the cover is. I felt like it didn’t represent the story well. When I first saw it, I thought it was a Gladiator book, especially when put together with the title. I really enjoyed Nemesis and felt like it was such a quick paced read. I can’t wait to see what happens in the next book. NYT Bestselling YA author of The Syrena Legacy series: OF POSEIDON (2012), OF TRITON (2013), OF NEPTUNE (2014). Repped by rockstar Lucy Carson of the Friedrich Agency. I live with my husband and daughter in the Florida Panhandle. I have a southern accent compared to New Yorkers, and I enjoy food cooked with real fat. I can’t walk in high heels, but I’m very good at holding still in them. If you put chocolate in front of me, you must not have wanted it in the first place. Shatter Me, Cinder, Linger, Shiver, Forever, Pushing the Limits, Unravel Me,Shadow and Bone, Enclave, Divergent, Candor, Graceling, Fire, The Hunger Games Trilogy, The Host, Most of James Patterson, and Janet Evanovich makes me laugh through my nose in an unfeminine sort of way. 1 winner will receive a finished copy of NEMESIS. US Only.